Hashtags became a part of everyday lingo for active Twitter users, but now they are popping up in the strangest places. You are likely to find them on your television screen while you are watching your favorite shows, on printed pieces arriving in your mailbox, splashed across other social networks (Facebook, Google+, Pinterest, and Instagram), and prominently displayed on event banners, billboards, websites, etc. 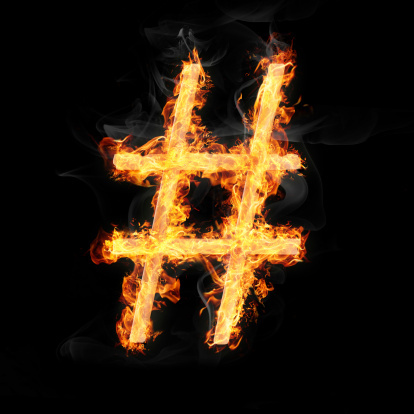 So what is a hashtag and how do you successfully implement this tactic for your brand? Wikipedia offers this definition: “A hashtag is a word or a phrase prefixed with the symbol #, a form of metadata tag.” The goal of hashtag campaign is to organize conversations based on a particular subject and attract the “right” audience to a global discussion. A hashtag can be a buzz building asset to a brand in regards to promoting a conference, webinar or product launch. They are also valuable content categorizing tools for sharing information or ideas. There are many hashtag strategies available and we’ve gathered our favorite tips and tools for creating a successful campaign. As with any communication tactic, the first step involves careful planning. Determine the goal of the campaign and the strategy that will help you achieve success. Remember that you cannot make something go viral. Your expectations need to be realistic and measurable. Create a contingency plan for the likelihood that your hashtag will be high jacked. We’ve seen epic hashtag failures (Starbucks) and (McDonald’s) and you should make your selection with caution. PRDaily suggests making fun of the proposed hashtag in-house and monitoring your audience to see if a natural selection is already being used to communicate about the topic before launching your campaign. Keep the hashtag simple, short and consistent. Make sure your audience will be able to quickly grasp the meaning behind your hashtag and will relate with it enough to retweet or share with their followers. Being mindful of Twitter’s character limit, incorporate your hashtag into your tweets without simply adding it to the end of the thought. It is best to make it flow into your conversation naturally. Less is more. Adding more than 2 hashtags to a post can decrease your chances of being retweeted. Avoid the temptation to make every word a hashtag in your tweet. Limit usage to the most relevant keywords in your message. Cross promote your hashtag through other communication channels. Add it to your signature, Twitter bio, website, and printed pieces. Once the campaign has launched, remain consistent and monitor the hashtag carefully.